Contact lenses rest on the front surface of the eye. Like eyeglasses, they bend light rays so images are properly focused on the retina. Unlike eyeglasses, contact lenses follow your eye’s natural movement and frequently provide better vision than traditional eyeglasses. We offer you and your family complete contact lens services. We are equipped with a state of the art computerized corneal mapping device which provides us with essential corneal information that traditional measurements do not. Our contact lens department keeps a substantial inventory of diagnostic contact lenses to help expedite your fitting and maximize your vision. We specialize in patients who have been told by other practices that contacts are hard to fit, taking pride in offering these patients the quality of vision that they would like to achieve. Do you have questions or concerns about contact lenses? Check out our FAQs here. Galo Andrade, the Director of the Optical and Contact Lens Divisions at each of Stahl’s three locations, has been certified by the American Board of Opticianry and the National Contact Lens Examiners and has been an active member of the Contact Lens Society of America and the National Academy of Opticianry since 1987. Galo was recently hand selected by Blanchard Contact Lens Inc. to complete their specialized certificate in BCL Research and Professional Development. Whether you are new to contact lenses or have already been wearing them, the world of contacts has changed drastically in recent years. Here at Stahl, we are able to achieve the best vision for all patients without sacrificing comfort. Our Contact Lens Specialist, Galo Andrade, has been trained specifically in the field of contact lenses. Having spent 20+ years honing his skills, he provides the most technological options being offered today. 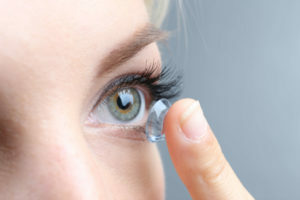 Many of the specialty contact lenses are considered medical necessities. Therefore, they may be covered by your health insurance or vision plan. Specialty soft lenses are extremely effective for patients who have a history of discomfort in wearing hard lenses (gas permeable lenses). They can be customized for patients with extreme degrees of astigmatism and even patients with Keratoconus. These lenses can be designed with any diameter in mind. These fully customizable lenses offer maximum comfort and are available even as a disposable lens. Gas Permeable or RGP (Rigid Gas Permeable) lenses have been the go-to lenses of choice for patients with Keratoconus or other corneal disorders since they provide the best visual acuity, but they were previously uncomfortable and would fall out. That has all changed with technology. GP lenses are hybrid lenses that now specifically designed with larger diameters and multiple curves to fit irregular corneas comfortably and effectively. By combining a hard and soft lens (by literally piggybacking them) you get the comfort of a soft lens with the visual acuity of a GP lens. You can wear this combination for longer periods of time more comfortably. It is very therapeutic for the eye (they function as a specialty bandage for the cornea) and especially effective for patients who work in dusty environments or suffer from allergies. Piggybacking is also a great way to train a person in using GP lenses. The soft lens/hard lens combination can eventually train the eye creating a smooth transition towards solely GP lenses in time. Scleral Lenses are the newest in technology on the market today. These lenses fit over the front surface of the cornea, trapping a liquid barrier (a preservative-free saline) between the lens and the cornea to eradicate dry eye. The lens rests beyond the corneal boundaries, known as the Sclera. Since the lens stretches over the cornea, it is very comfortable to wear and keeps the eye moist. Some patients claim these to be more comfortable than soft lenses since they retain moisture (Scleral lenses can be used therapeutically to treat dry eye). They also do not fall out, making them great for physical activity. The Scleral Lens is an excellent option for patients who suffer from Keratoconus, corneal ectasia, Stevens-Johnson Syndrome, Sjogren’s Syndrome, post-Lasik complications, complications post corneal transplant, and those who have suffered from chemical and burn injuries. Stahl’s Contact Lens Practitioner, Galo Andrade, has been successfully helping patients with advanced Keratoconus for over a decade. He specializes in working with Keratoconus, Keratoglobus, Pellucid Marginal Degeneration, Corneal Dystrophies, Sjogrens Syndrome, and post-surgical corneal graft rehabilitation. CRT (Ortho-K) Orthokeratology is a non-surgical method of vision correction, which allows patients to experience clear vision without the use of glasses or contact lenses during the day. With orthokeratology, a therapeutic lens is inserted into the eye every night and worn while sleeping. The lens reduces myopia or nearsightedness over time by reshaping the corneal surface. Once the lens is removed in the morning, one can experience clear, natural vision for the full day to follow. Improved vision is seen within the first few days of beginning treatment and patients achieve optimal vision within the first two weeks of CRT.